How do you know which melt-and-pour soap base to use? Which one should you pick for your soapmaking project? 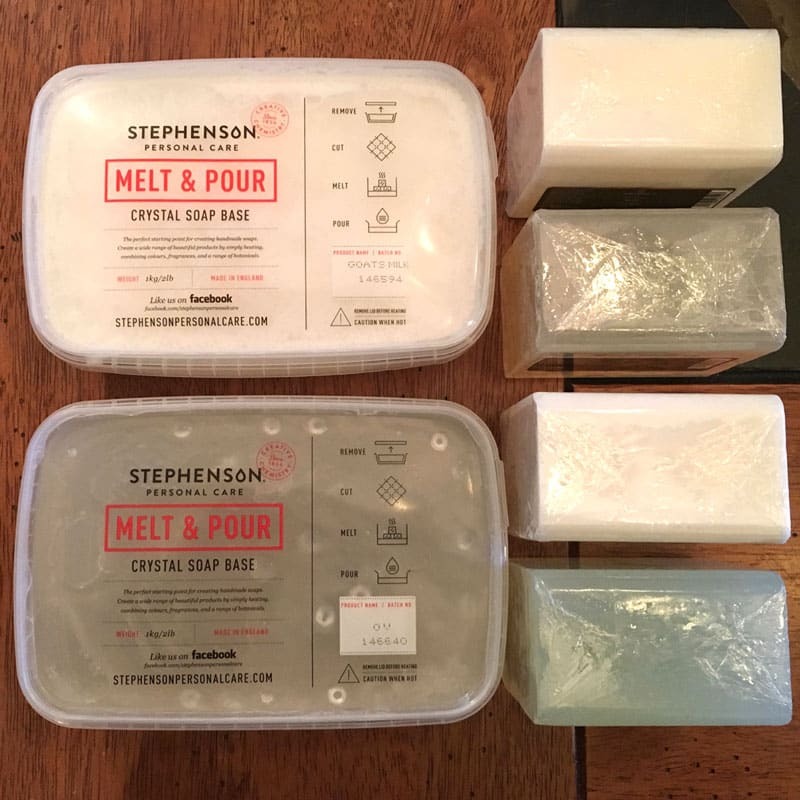 Here are reviews of the 6 most popular melt and pour soap bases. Making soap using the melt-and-pour method is the easiest way to make homemade soap. It’s especially fun and easy with kids, because you aren’t using caustic lye–that part of the soapmaking process has already been done for you. But how do you know which melt-and-pour soap base to use? A quick Amazon search will give you more than 100 different ones to choose from. Which one should you pick for your soapmaking project? I’ve done all the hard work of comparing soap bases for you! 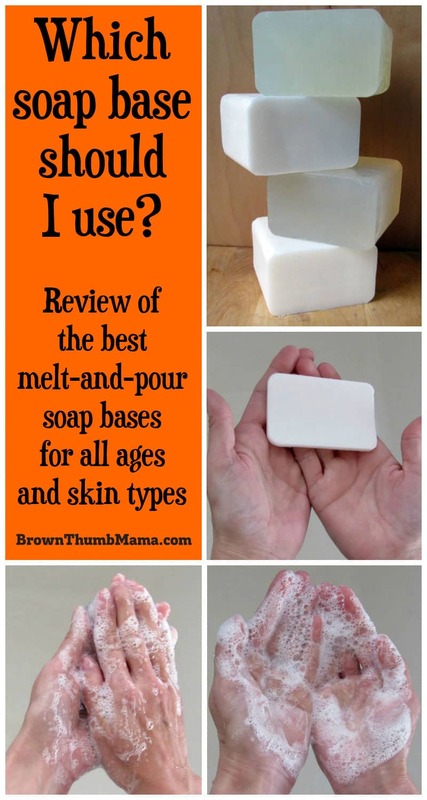 Here are reviews of the 6 most popular melt and pour soap bases, what type of skin they are best for, ratings of their bubble-making ability (very important to the 6-year-old), and the different qualities that make some soaps better than others. Once you’ve decided which base is right for you, here are easy instructions on how to work with your soap base and customize it with herbs and oils. Here’s how to choose the best melt-and-pour soap base for your soapmaking needs. 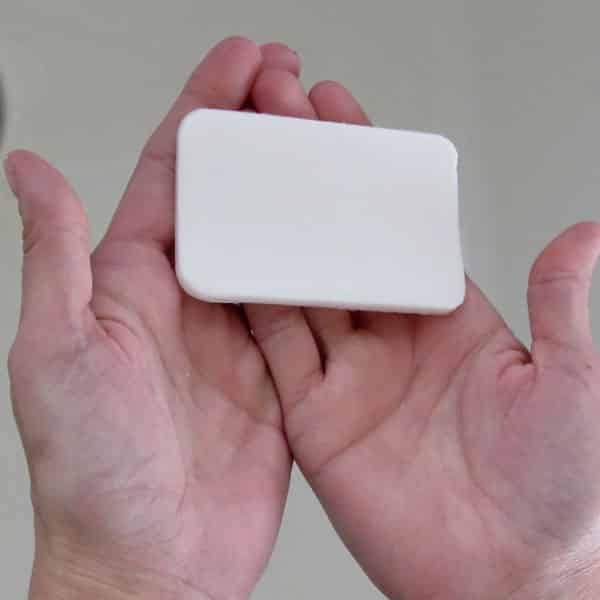 The name “glycerin soap” is a bit misleading, because glycerin is present in all soaps. 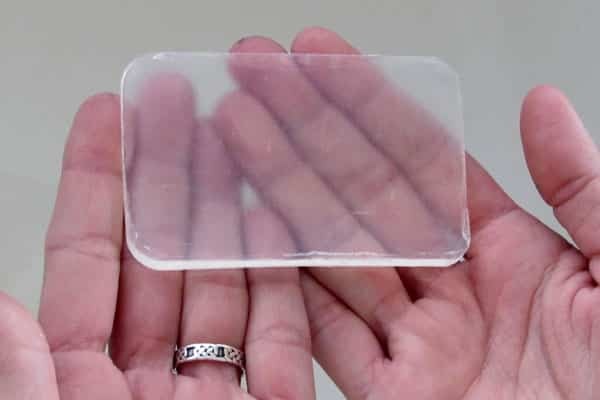 This soap base has additional glycerin added and is processed in a special way so it is translucent. Features: Glycerin is a humectant, which means it is moisturizing. Bubble rating: 3 out of 5 for good bubbles. Shea butter is made from the nut of the karite tree, which is found in central Africa. It’s used in many natural hair and skin products, including this melt-and-pour soap base, because it helps moisturize and strengthen hair and skin. Features: Shea butter is moisturizing and nourishing. Best for: those with dry skin or [cough] mature skin, like me. Bubble rating: 5 out of 5 for excellent bubbles. 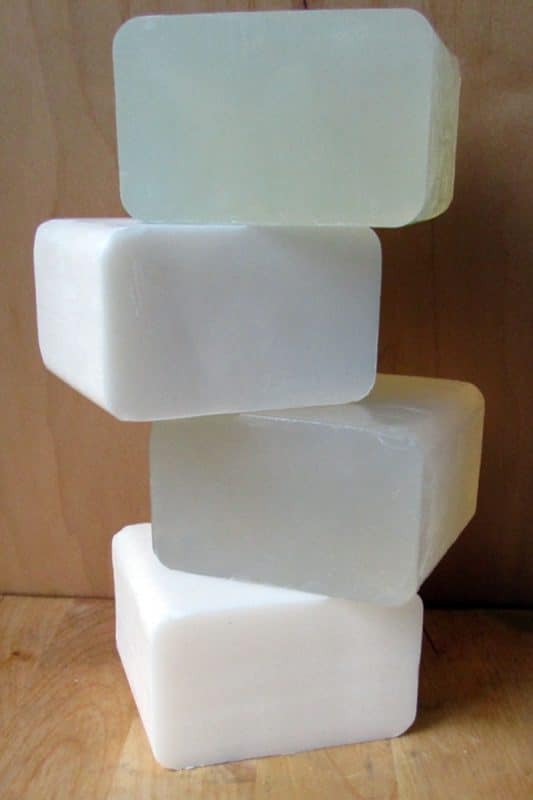 This soap base is made in the same way as the glycerin soap base above, and it has aloe vera added. This makes the soap soothing, with a silky texture. Features: Aloe vera soap is both soothing and healing. Best for: those with acne. Cocoa butter is the fat from the seeds of the cacao bean–yes, the same plant that gives us chocolate. Cocoa butter melt-and-pour soap base does smell faintly of chocolate, which makes it a great way to start your morning. Features: besides smelling divine, cocoa butter is rich and moisturizing for the skin. Best for: Cocoa butter is recommended to help reduce stretch marks. This would be a great soap to make for an expecting mama! Bubble rating: 4 out of 5 for very good bubbles. My first question was, “Why goat milk? Why not cow milk?” It turns out that goat milk is naturally hydrogenated (the cream doesn’t float to the top, but is evenly distributed throughout the milk). This makes goat milk soap base both rich and moisturizing. Features: goat milk is nourishing for the skin, and contains vitamins and minerals that help keep skin healthy. Best for: everyone, but especially helpful for sensitive skin, eczema, roseacea, or problem skin. Remember when doing a “hot oil treatment” on your hair was a big thing? Olive oil is used for hair and skin products, including melt-and-pour soaps, because it’s extremely mild and nourishing. Best for: the whole family (babies to grandparents). Once you’ve mastered melt-and-pour soap, you’re ready for the next step! Making your own soap from scratch is easy with the detailed instructions in The Natural Soapmaking Ebook Collection by The Nerdy Farm Wife. 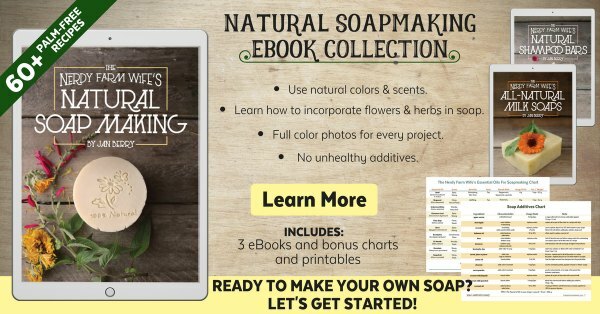 It contains everything you need to know about making your own natural soaps, milk soaps, and shampoo bars. There are lots of photos and step-by-step instructions. You’ll love it! 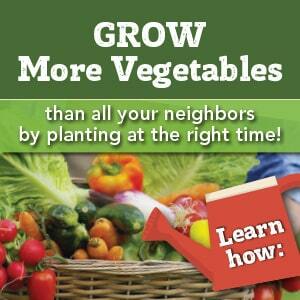 Click the photo to learn more. Thank you for this! I needed all the info you supplied! Could you test two more soaps? I’m looking for information on the African Black and Triple Butter melt and pour soaps also. FYI: Totally fantastic job on the soaps rating. GREAT IDEA! Thank you so much for sharing your knowledge about soap-making using natural ingredients. Love it! Can the bases be mixed? Like, I love goat’s milk anything. But I also like cocoa & shea, would it work if I mixed all 3? William Bill Creasman! aka Bill! Sure! The texture might be a little soft, but it should work fine. Hi Lisa I live in South Africa, and use African Black soap constantly, suffer with dermititis and really is a fantastic soap, a lot of friends i make for just love it, seems to clear up excema, spots and other skin problems, the best soap ever and totally organic. You can combine bases, or use one and add the other milk/butters for moisturizing properties. I’ve had great success with both. I have been researching essential oils benefits and making soaps for friends for a few months now. Everyone tells me I should start selling them so registered for my DBA…However have been reading up and if you claim that soap helps with different skin ailments it could be considered a cosmetic or medication. Has anyone had an issue with this and should I go to get FDA certified. Started out as a hobby but it’s really taking off and don’t want to have any problems. I label all ingredients on label and specify for external use only. Anyone have info to help with this. What goat milk soap do you recommend? The link just goes to amazon, no specific product.